TO STOP BEING STUCK, VOTE FOR US AND GO FORWARD ECUADOR, GO FORWARD! Over the weekend, businessman Alvaro Noboa, leader of the Adelante Ecuatoriano Adelante party, traveled several corners of the country along with the candidates for Assembly members who represent the various provinces. On Friday, January 27, he went to Las Orquideas and Los Vergeles sectors along with Sofía Caiche, a candidate for Assemblywoman of District 2 and other hopefuls. There, the residents clamored for urgent help, because they pointed out that the lack of employment and crime are a daily occurrence. The next day, in the middle of a caravan, the AEA leader moved to the Pichincha Province, precisely to Sangolquí, where a hundred supporters waited for him with joy. Sources of employment, lower taxes, social security, loan facilities, economic stability, drug eradication, fight against corruption were some of the requests of this Ecuadorian population. “We have to correct that. There must be work sources again in Ecuador. There must be circulating money for business. We must lower the taxes so that families have a dignified life. We must eliminate drugs trafficking, improve our health, and improve our education system. For that, I ask all Ecuadorians to vote for us, so that those who are going to represent us before the Assembly collaborate in the next government, and we can solve together the problems of all Ecuadorians. 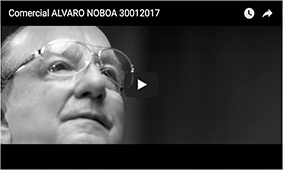 Go forward Ecuadorians, vote for us!” said Alvaro Noboa.